As the chart below shows, there’s no question the use of TDFs in 401k plans has exploded since the Department of Labor (DOL) endorsed them as a safe harbor for automatic enrollment plans. 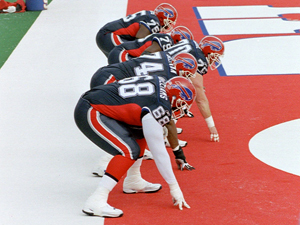 But, given all the controversy surrounding TDFs, was that endorsement premature? The Investment Company Institute, the mutual fund industry’s association, states one of the primary features of TDFs is “avoiding extreme asset allocations: Research shows that some young workers invest very conservatively, by allocating all or almost all of their accounts to fixed income investments, while some participants nearing retirement invest very aggressively, allocating all or almost all of their accounts to equity. 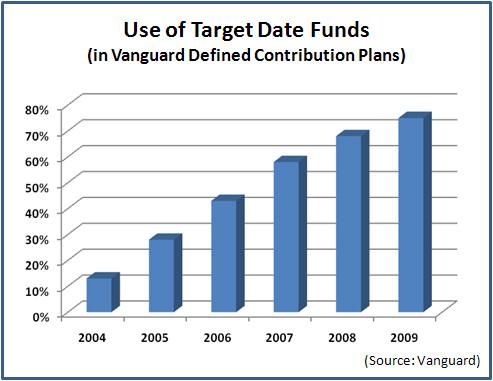 Target date funds follow professionally designed asset allocation models to eliminate such extremes.” (“Frequently Asked Questions About Target Date Funds,” ICI, June 2009). Yet, the debacle of 2008 exposed major flaws in TDFs, many of which committed the same mistake of investing “very aggressively” near retirement the ICI claims they were designed specifically to avoid. (“Many Target-Date Funds Miss Their Mark,” U.S. News, November 14, 2008). Clearly, TDFs still had a few bugs to work out when the DOL blessed them following the Pension Protection Act of 2006. In general, government, and the DOL in particular, has a fairly poor record when it comes to investment guidance. (e.g., just earlier this year the DOL was caught unintentionally advocating index funds – just when evidence was beginning to show these products didn’t necessarily perform as advertised. See “3 Terrible Problems the New DOL Investment Advice Rule Poses to the 401k Fiduciary,” Fiduciary News, April 6, 2010). Fiduciary News asked industry leaders if they felt the DOL too quick to embrace these untested products. And therein lies the dilemma. As the ICI note indicates, TDFs primary function serves to take long-term investors out of short-term investments and place them into more appropriate long-term investments. Alas, we all know that old adage about good intentions. And maybe the marketplace is the only place we can count on. This summer, after a series of congressional hearings in the spring, the SEC asked the public to comment on TDFs. During the 60-day comment period, the SEC received only 44 comments – and this includes comments from lawmakers apparently miffed nobody heard them in their hearings. Industry professionals believe the concept of TDFs remains sound, but acknowledge problems exist. The race is on, then, between finding an adequate solution for TDFs and one sudden market cataclysm that spurs a slew of fiduciary liability lawsuits. Do have your own thoughts on the long-term viability of TDFs? Please leave a comment below and share those ideas with others. Like this article? You might be interested in reading other articles in this series.